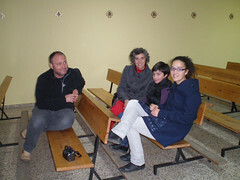 On Monday, May 24th, two sisters from the Fabero community went to Toledo, to the “Europa” Public School, where Sister Inmaculada's nephew, Alejandro, is in the fourth grade. There, we gave our missionary testimonies. The boys get a retreat, too! 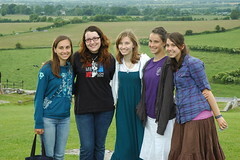 On Saturday, May 22, the sisters of the community in Fabero once again held a retreat for the girls of the town. 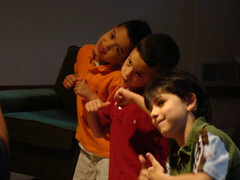 And this time, the enthusiasm was even greater when the boys found out that there would also be a retreat for them, too. Fr. Reinhard, along with three novices: Br. Luke, Br. Peter, and Br. Andrew, spent the day at the sports center in Lillo, a town located 5 minutes from Fabero, also in the Province of León. 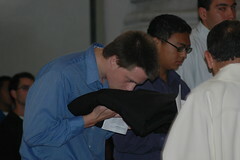 There was a group of 15 boys, including 3 older boys from Confirmation classes, to help out in the activities. On the occasion of the Confirmation of María Angélica Pérez on May 23, the Solemnity of Pentecost, the members of the Home of the Mother in Canada were happy to receive a visit from Cheryl de la Cruz and Jennifer Abendroth, members of the Home who live in Florida. The activities were diverse and our guests headed the youth group on Friday, the Saturday morning children's group, and afternoon activities with the girls. 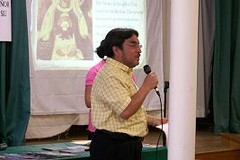 We are very happy to announce that we held a presentation of the Home of the Mother in the Parish of Saint Margaret in Waterbury, Connecticut. Eva, Marina, and Ray Hernandez; Laura and Marilee Perugini; Jose, Marta, and Klarisa Pezo, took great delight in preparing the presentation. Thanks to our efforts, the power of the Holy Spirit, and the Blessed Virgin Mary, and your prayers, we think that the encounter has been a fruitful event. 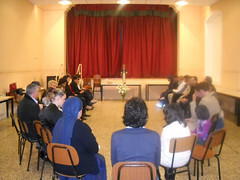 On Sunday, May 2nd, which was Mother's Day in Spain, we had the great joy of beginning the Home of the Mother in its lay branch here in Lumezzane, thus being able to offer this gift to Our Mother. Here in Fabero, Leon, we had been trying to hold a "missions day" in the parish. However, the snow and the many coinciding activities or ceremonies had made it impossible. Finally, the weekend of May 15-16, Rafa Samino, a member of the Home who has been to Ecuador several times to help us in our missions there, was able to come here to give his missionary testimony. 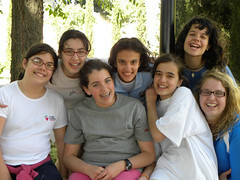 This past weekend, May 14th-16th, we once again had our girls’ retreat here in La Aldehuela (Madrid, Spain). 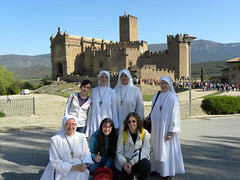 During the retreat days, we visited the “Cerro de los Angeles”, the geographical center of Spain and the site of an immense statue of the Sacred Heart of Jesus, to whom Spain was consecrated in 1919 and where Saint Maravillas de Jesus, a Spanish Discalced Carmelite, founded her first convent. The weekend of Pentecost, May 22-23, the Servant Sisters of the Home of the Mother here in Rome, Italy were led by the Holy Spirit to go to the small town on a mountain top named Monte Vidon Combatte, located on the outskirts of Ascoli Piceno, about 3 hours north of Rome. There are a few families there who are members of the Home or who often attend activities of the Home. This past Sunday, April 18th, approximately 90 students from Ave Maria in Nicaragua went to do missions in two communities located near the campus: La Hormiga and Buena Vista. We got to Buena Vista at 9:30am and once we got to the site of the mission, we gathered together to pray and sing while the groups were formed for going out to evangelize. resThe Servant Priests/Brothers of Nicaragua took a day trip to 2 of the 14 volcanoes present in this country, at the Masaya Volcano National Park. Our little family: Monica, Quino, and Almudena, spent the weekend in Barcenilla to celebrate our 2nd Wedding Anniversary and spend Mother's Day there. We had planned to spend Saturday night in Las Caldas de Besaya, the Monastery where we were married near Torrelavega (Cantabria), but Barcenilla has that something special that made us change our plans right away and in the end, we spent the entire weekend there. April 23-25, over 600 young people participated in the traditional "Javierada" (pilgrimage to the birthplace of Saint Francis Xavier in Javier, Spain) organized by the Diocese of Getafe. This year, the theme was: "Come, Share Your Master's Joy" (Mt 25:21). For our community here of Servant Sisters of the Home of the Mother in Getafe (Madrid, Spain), it was our first "Javierada," which we attended along with a group of young people from the parish where we work in Mostoles, "Nuestra Señora del Rosario de la Esperanza." 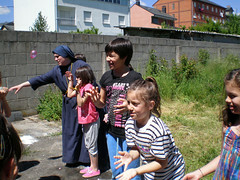 Over the course of the year, the Sisters here in Fabero (León) have been organizing get-togethers and retreats with grade-school aged girls. 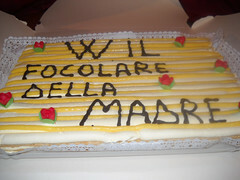 The most participative are the second-graders. 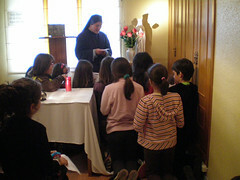 They just started First Communion classes and are like sponges, absorbing everything we teach them. They like to play, sing, and do crafts. We all know that the Home of the Mother's third mission is the conquest of the youth for Christ. This is why we always try to tap into our imagination, using any way possible to bring them to Our Mother and to Christ. 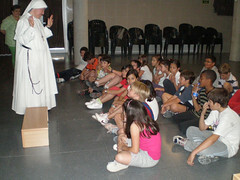 Of course, we are also trying to do this here in Fabero (León). 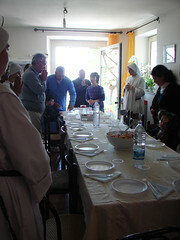 The weekend of April 17-18, we celebrated a day dedicated to the Home of the Mother in Lumezzane. 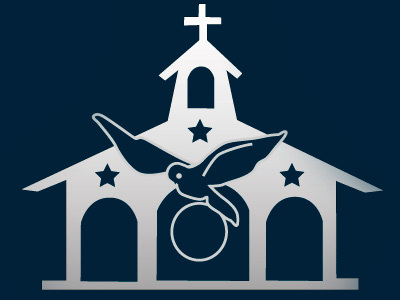 The idea had come from the Pastor of our parish, Fr. Tino, who wanted to have a weekend dedicated to making the charism of the Home of the Mother and of the Servant Sisters better known. The Servant Sisters have been working there at the parish since September.